The Free Persona Analysis Slide for PowerPoint is a flat vector presentation to describe the customer’s motivation. The purpose of persona analysis concept is to create a content focus against its target audience. But to do so, the professionals must analyze the pain points, situations, and stakeholders. The free slides of persona analysis contain 4 steps horizontal process flow between the clipart user icons. PowerPoint provides clipart icons of both male and female gender. In this way, the slides demonstrate an equal opportunity through graphics of suppliers and buyers. For example, the two persona categories could be the product developers and departmental managers. Where gender may play a significant role, depending on the industry. Therefore, the horizontal process flow diagram can assist the audience to walk through the analysis process. For instance, from identifying the categories to the pain points and then content planning against these pointers. 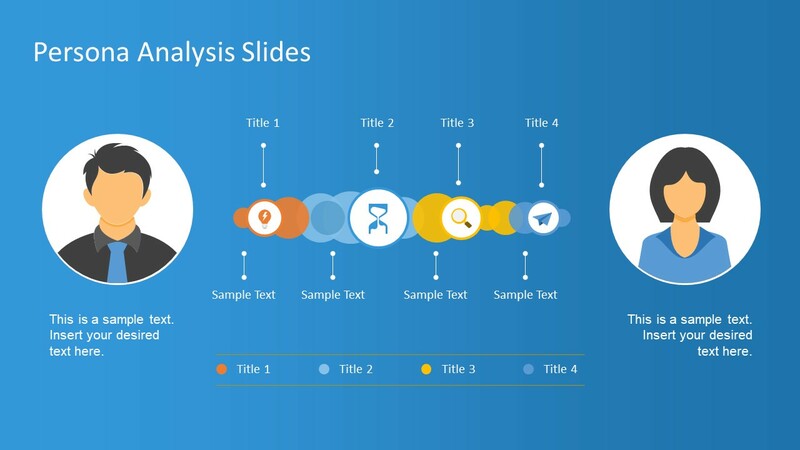 The Free Persona Analysis Slide for PowerPoint shows the similar layout design of templates in assorted colors. For example, the free slides of blue and white background. 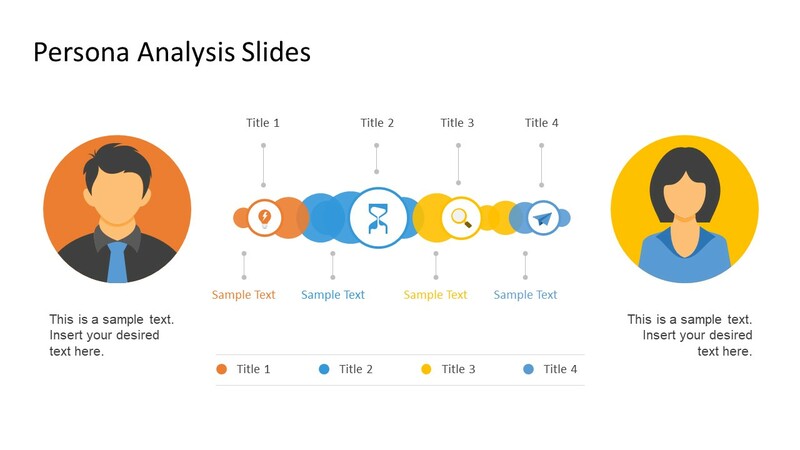 Moreover, PowerPoint templates like this one include shapes and icons in both slides also have distinct colors to suggest the editing options in PowerPoint. Each clipart shape of PowerPoint is made-up of small editable icons producing a meaningful visual. PowerPoint offers customizations like color fills and gradients, shape size and styling etc. For instance, replacing the horizontal path of a few circles can easily be replaced by other shapes in the format menu. The premium subscription users can find the persona analysis slides for PowerPoint here. Alternatively, you can download the Persona Analysis PowerPoint template from our main catalog. The free PowerPoint of persona analysis concept is an ideal slide layout for large to small companies. Especially non-profit and defense agencies which require an extensive research on alternative scenarios. Presentation of persona analysis enables the user to focus on getting requirements for new products from the audience. Further, it aids as a blueprint for the content planning in both the development and sales of product or service.